You have already seen a number of some conventional coffee tables on our website earlier. But this one is going to be entirely different in design and appearance as well. A coffee table is a mandatory element of furniture, your sitting arrangement is pretty incomplete unless you do not have a fine coffee table. This is the basic need of every house hold. When you go out there in the market, you have to spend a lot of money on buying these traditional furniture items. But if you learn the art of recycling, trust me it is going to be a complete transformation of your life. Coffee tables vary in price range and designs obviously. But one thing I am sure about is that none of them is cheap cost wise. But if you make one by recycling the wooden pallets, all it takes is a couple of some fine pallets, some basic wood work tools and your domestic work shop. Then you just acquire some inspiration and start working on that. So as we discussed earlier, this pallet coffee table is going to be entirely different. It would not be having same typical upper sheet. 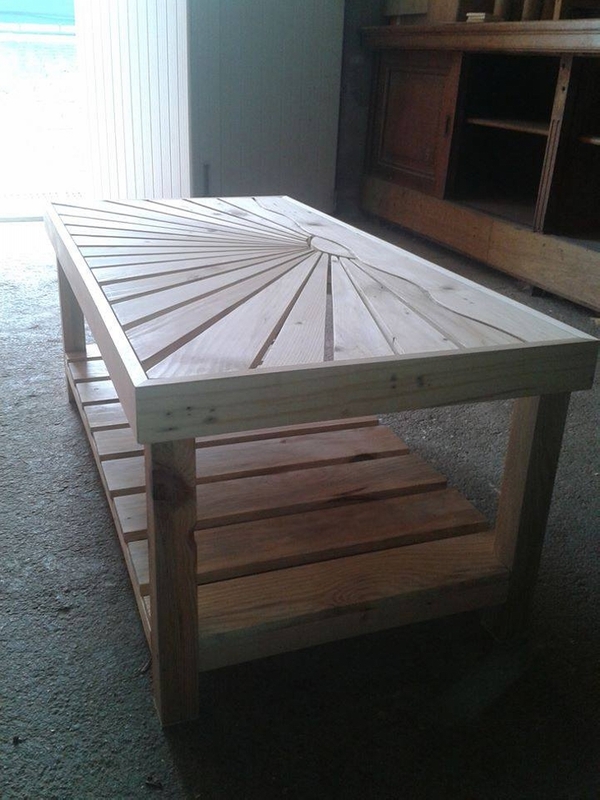 Let’s have a detailed discussion on this pallet coffee table, its feasibility and making or recycling. Some very fine and well sanded wooden raw pallets are used in making the basic structure. 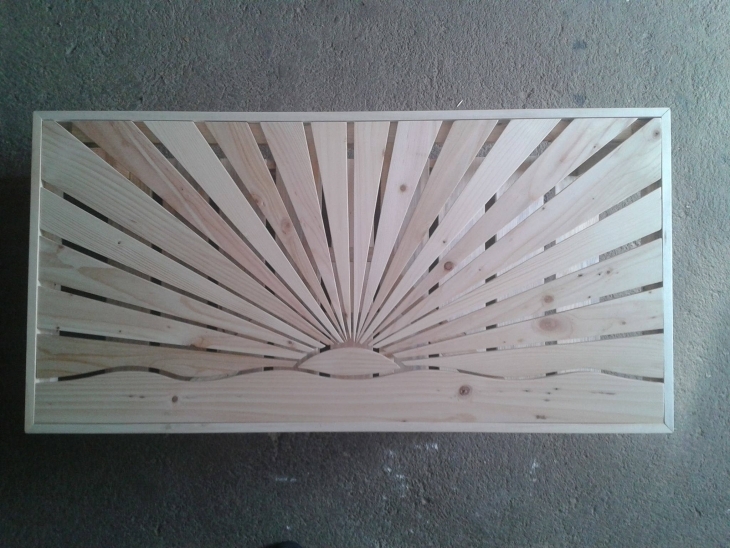 While immense skill is displayed in making the upper portion of this pallet coffee table. There is a zig zag shaped pallet strip on the one end, then a circular top, each wooden pallet plank is cut in a receding pattern from upward to downward. and they are joining each pallet on that circular base. 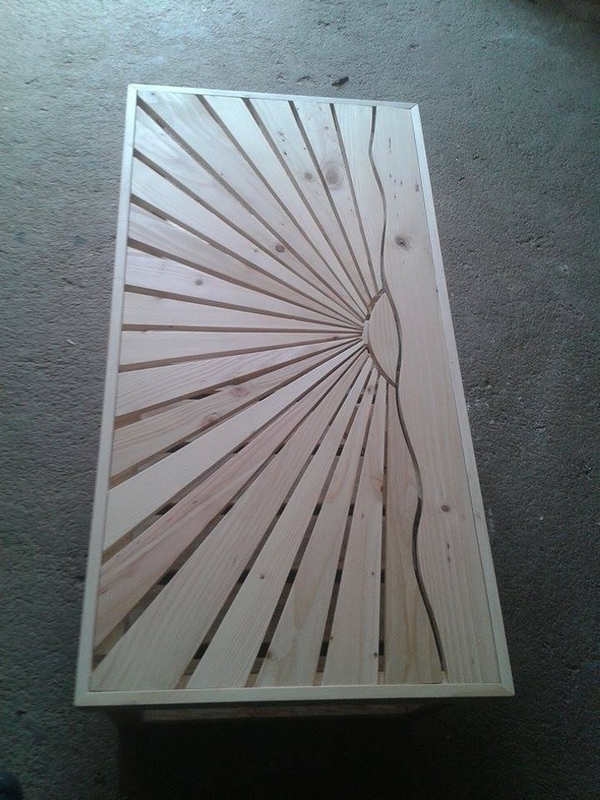 This is a very well designed pallet coffee table reflecting great art and skill.